Her work has been published in major independent music magazines such as Upset, DIY and Dork. She manages to juggle a jam-packed workload as house photographer for O2 Brixton and a part-time job at a pharmacy two days a week. She is Sarah Louise Bennett – a music photographer best known for capturing live shows, festivals and editorial portraits. I caught up with her to talk all things photography in Workshop Coffee, a favourite spot of her’s just off Regent Street. Bennett’s love for the art blossomed young, after taking her camera to her first gig when she was 15. “I didn’t really clock it was a thing until I saw a photographer,” she remembers. This was the moment that set her off on a career path that followed her passion. She went on to take a photography A-Level at the Piggott School Sixth Form – her year was the first cohort to study photography at the institute. The college failed on promises to provide certain necessary equipment, however, this encouraged her to pursue photography to degree-level at Nottingham Trent University. Her university choice was influenced by her upbringing. Bennett grew up in Reading, a stone’s throw away from London. “I knew I wanted to go to a city – that was non-negotiable for me. I needed somewhere where there was music going on,” she explains. Despite being so close to London she was drawn to Nottingham by the vibe of the university and the various different music venues the city has. From the independents like Rock City, The Rescue Rooms and Bodega to the Motorpoint Arena and the Theatre Royal for bigger shows, Bennett knew Nottingham had a diverse and vibrant music scene that would offer a lot of interesting subject matter to photograph. After graduating, she felt it was necessary to return to London to further her career. “To be honest if you do photography you’ve got to be close to London. There’s a certain amount you can do a bit further out but you’re going to be travelling down a lot,” she says. 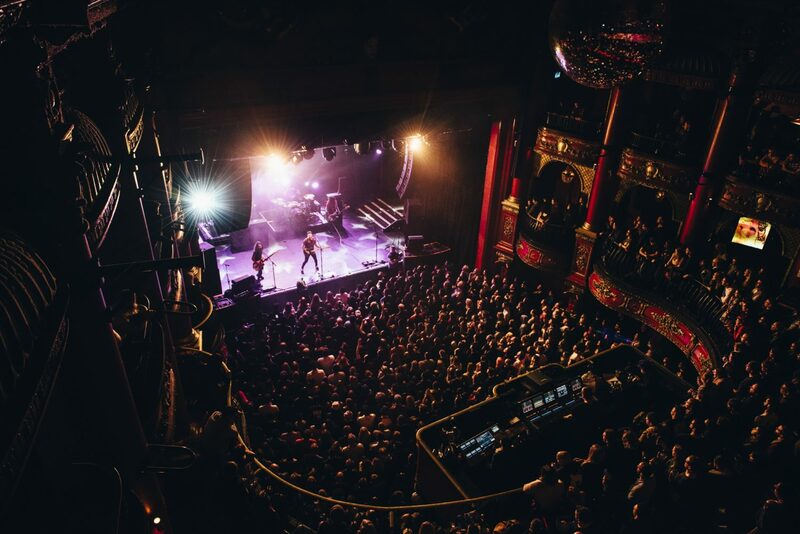 Bennett moved back to her hometown and started photographing for The O2 Academy Oxford. This, plus shooting various shows in London and portraits for different magazines, was the start of her career in music photography. She also recommends using initiative and being prepared to start small. “Go shoot local shows, message bands on Twitter and Facebook. Start with smaller bands, get a portfolio together and then start contacting publicists, smaller websites and management. “Get shooting and talk to people. It’s terrifying, but talk to people,” she adds. She may be photographing big bands at major venues these days, but Bennett still gets anxious before a shoot sometimes. She remembers one particularly harrowing experience taking portraits backstage at Wembley Arena for Fall Out Boy (one of her favourite bands). “I grew up watching their videos and listening to them, I love that band. I borrowed some lights for it and found everything out, and then I missed my train, so I was running late.” Despite this she still arrived at the venue on time but missing the train had set her on edge. “I get panic attacks, I was like ‘stay calm’, I managed to hold it together and get through it,” she says. While Bennett was setting up the lights Patrick Stump, the lead singer of Fall Out Boy, was being interviewed for a feature. He happened to be talking about getting stage fright before a show and how he was a reluctant front man. “This guy that I’m terrified to meet has the same worries that I do,” Bennett says. Hearing that helped her appreciate that “everyone is just a human being at the end of the day, we all do the same stuff”. After this experience Bennett’s nerves started to fade a little every shoot. Although she doesn’t get as nervous now, she still feels like she needs to psyche herself up before a portrait shoot. “It’s a lot of extra energy; you have to run a room full of people and hold their attention and keep on the ball. I just pop some tunes on the train and get my head in the zone,” she reveals. ‘The zone’ is somewhere Bennett needs to be pretty often as she’s a self-confessed workaholic; constantly filling her schedule with live shows, portraits, editing and her pharmacy work. Although quite a departure from her photography work, by having a part-time job providing regular income she can pick the work that she chooses to do. “I get enough stuff but it’s not always stuff that makes your heart sing. I didn’t want to kill the love of it [photography, by accepting lots of jobs she dislikes],” she explains. She went on to explain about a Twitter account, which tweets every week about the percentage of women with major bylines for each publication globally. “It’s really interesting to see what publications are balanced. None are completely but there are some that are getting there. It’s not something you think about otherwise,” she says. Catch Bennett’s work here in the latest issue of Upset magazine.